Bury gets its name from Saxon times when it meant a "stronghold". Probably the area was covered in marsh and moorland inhabited by nomadic herdsmen. It is known that a township and ecclesiastical parish existed from very early times and the evidence of much earlier habitation was indicated by the discovery of a barrow or funeral mound, probably of bronze age origins, located at Whitlow Hill, Ramsbottom. The Romans were in the area when Gaeus Julius Agricloa, Governor of Britain from AD 78 to 87, founded Mancunium (Manchester) and built roads, one of which crossed the Borough. Bury has grown over the centuries from small Bronze Age settlements along the banks of the Irwell. By Medieval times, it was a market town for surrounding agricultural areas. In medieval times the lords of Tottington, the De Montbegons, held most of the area. This barony was held on the Honour of Lancaster and granted by the king to Roger de Poictu at the end of the 11th century. Later, from 1193 to 1219, Adam de Bury held it as "one knight's fee of ancient tenure". 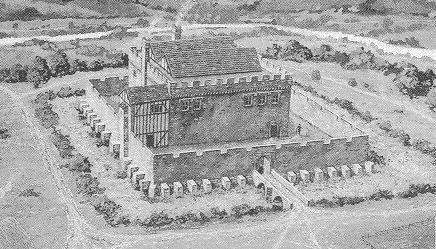 Alice De Bury married Roger Pilkington and the manor passed to the Pilkington family until 1485. It boasted a castle, built by the Pilkington family. In 1485 the lands were forfeited because Sir Thomas Pilkington paid allegiance to Richard III and the new king, Henry VII, passed the lands to Thomas, Lord Stanley, later Earl of Derby after the Wars of the Roses, and the family are still major landowners in the areas to this day. In the south of the borough most of the land was aquired by purchase by Lord Grey De Winton and his succesors the Wilton Family. In the early 19th century the industrial revolution brought prosperity to Bury and the surrounding area with businesses engaged in the manufacture of cotton, bleaching and calico printing. John Kay, inventor of the Flying Shuttle, was born in Bury. That and other inventions brought prosperity to the town with the manufacture of cotton, bleaching, calico printing and paper-making. Bury's most famous son is Robert Peel, founder of the modern police force, born in 1788 to a wealthy local industrialist. Peel became Prime Minister in 1841 and his most famous act was to repeal the Corn Laws. He was also the first man to impose income tax in time of peace. He died in a riding accident in 1850. In his honour the famous Peel Tower which tops Holcombe Hill was erected from public subscription, and a statue of the great man was erected in Market Place, Bury in 1852. Nowadays the flourishing borough features businesses of all kinds, many with international reputations.